The UK's only exclusive seller and agent of these stunning candle luminary lantern bags. And I'll post anywhere in the UK or to the rest of the world. 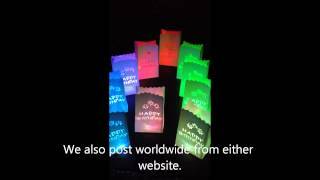 Please click the Paper Bag Candle Lantern Web Store page and choose your product and quantity. For BULK enquiries of 100 or more see the bulk orders category or email Ollie direct at info@stormtrading.net or use the contact me page.